Just a week or so after starting Kaylen’s Write To Heal, we’ve been notified of a mom in need. My heart aches for this family. If you aren’t aware of Kaylen’s Write to Heal, please check it out and sign up now to be on the email notification list. Kasey was Dx. with a Glioblastoma Multiforme IV not long after his 8th birthday in 2006. 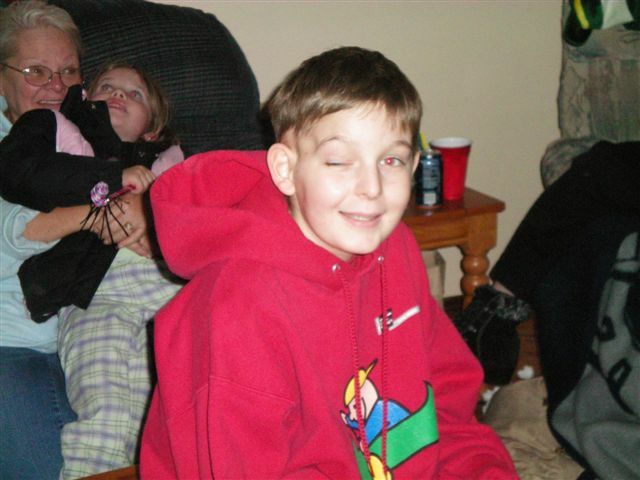 Kasey Radford went home to be with his Savior, Jesus Christ on February 4, 2009. Free from Cancer Forever! Make a donation in Kasey’s name for Relay For Life. Kasey turned 8 on January 1st, 2006. On January 12th Kasey was admitted to Doernbecher Children’s Hospital with bleeding in his right frontal temporal lobe. His team of Doctors and Nurses couldn’t say for sure what would cause this to happen. The various MRI’s, CT scans, and an Angiogram couldn’t see what was behind the blood. Kasey began improving on his own, so he was able to go home with a number of follow up appt’s and scans. Unfortunately, Kasey never really was 100%, and kept complaining of headaches. Emergency surgery was performed on Feb. 14th, 2006. Following another unexplained bleed in his brain. His team of surgeons met with his dad and I to give us the most disturbing news we could have ever gotten. What they had found when they were in his head, was an unusual aggressive malignant brain tumor. A tumor that had woven itself in and out of his brain tissue. They had removed what they could and in the end, couldn’t remove it all. It would take two weeks to get the pathology which came the dx. of GBM IV. The plan for radiation and chemotherapy had been layed out, and Kasey was set to begin radiation on March 2. However, on March 1, the tumor bled again, and radiation had to be put on hold. Kasey underwent his second surgery on March 3rd, 2006. Since then, Kasey completed 35 radiation treatments, and over a years worth of monthly chemotherapy treatments, which ended June 17th, 2007. MRI on December 13th. revealed some changes. Something new has started to grow in the area of the old tumor site. Radiologist report says it is consistent with tumor reoccurrence. Unknown at this time if it is in fact new growth or something benign. Surgery is scheduled for 1/03/08 pending Kasey’s Make A Wish trip, which is scheduled for 1/07/08 which we are hoping goes on as planned. surgery on 01/22/08 to debulk new tumor growth. Pathology confirmed GBM IV. New Chemo Etoposide started 01/31/08. MRI on March 26, 2008 revealed another reoccurrence. Porta cath placed in Kasey’s chest on April 8th, 2008. Chemo Avastin started on April 9th. Irinotecan and Avastin combo on April 23. Chemo infusion to be administered every two weeks. October 8th, 2008 MRI reports tumor cells in spinal fluid attatching to and growing on nerves and spine. Irinotecan/Avastin combo stopped. Leptomeningeal spread.. cancer spread to nerves around right eye. Attempt at Cilengitide phase II study denied. November 9th, 2008, oral chemotherapy Temazolamide restarted. Kasey suffered a minor TIA (mini stroke) MRI and angioCT revealed tumor continues to progress despite current chemo protacol. Pressing on ventricles causing stroke like symptoms. 12-15-08 Kasey started on baby aspirin. 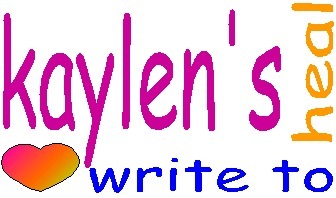 Please sign up for Kaylen’s Write To Heal to be included in the email notification list. I signed up yesterday. Great what you’re doing here, Katrina.